Just follow the steps, (press buttons in order like 1,2,3,4,5,6,7,8) and press render. Replace test object with your test object, assaign it existing “mia_material1” material. Change its preset or settings. hold your middle mouse button on and drag it to your Custom Shelf panel. Please check www.fxfx.org for updates. Download: FXFX Maya Real Studio 2 is available now! Previous How to explode and destroy a wall effect in maya? This is AWESOME man! Thank you very much! It saved my life! Hi kishore, can you tell us more about error? And what version of Maya do you use? hi kishore, there are lots of render engines for Maya, you just need google and try them. Here are some of them.. RenderMan, Turtle, Maxwell, 3Delight..
went i press the 8 button on my mac maya 2011 a warning you get an error , please firstly open your render setting and select ‘Quality’ tab and tried again. Yes, after the version 2011 and above in Maya, It cant load the render setting tabs itself so you have to open your render engine settings window, and you have to click Quality tab. It will load so. 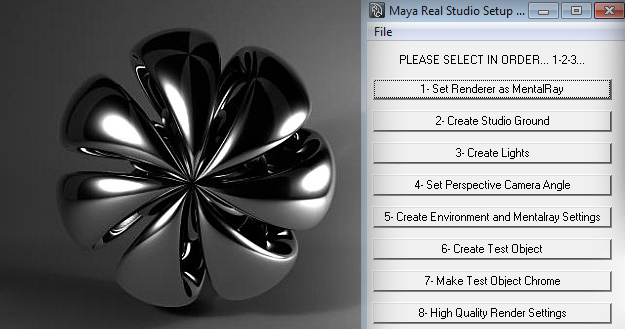 hi, im new tto maya, downloaded real studio 2 for maya 2011 and dont know how to install it.. can u help pls. You can find adding to custom shelf introduction in readme file. Dag nabbit good stuff you whippresnappres! I’ve actually been plnayig with the new cover designer for the past few days since getting the new covers ready for display at the LA Times Book Festival, and while most of it is really slick and allows for customization even within the templates provided, I don’t like the spine text feature not enough font sizes. I ended up going back to the old cover design to allow for larger spine text.There were a couple of other goofy little things that I can’t remember off the top of my head that made me go hmmmm. But overall, it is a really good tool and should help authors who are struggling with coming up with a cover the flexibility to come up with something a little more interesting than a stock photo.